Samuel Garland, born December 16, 1830, at Lynchburg, Virginia. Parents: Maurice Garland, an attorney, and Caroline M. Garland. Maternal grandparents: Spottswood Garland and Lucinda Rose. Before enrolling at VMI Samuel attended Randolph Macon College. Matriculated on October 22, 1846, at age 16; was graduated on July 4, 1849, standing 3rd in a class of 24. Elizabeth Campbell Meem in 1856; she died on June 12, 1861; their only child, Samuel, died in August 1861. Studied law at University of Virginia; practiced in Lynchburg, VA. Following John Brown's raid at Harpers Ferry in 1859, Garland organized the Lynchburg Home Guard. 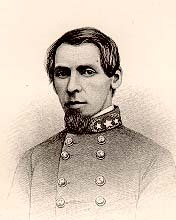 Colonel, 11th Virginia Infantry Regiment; led his regiment 1st Manassas; wounded at Williamsburg but did not leave field; promoted to Brigadier General in May 1862 and commanded his brigade at Seven Pines, Gaines's Mill, and Malvern Hill; mortally wounded on Sept 14, 1862, at South Mountain during the Antietam Campaign; buried Lynchburg, VA.
Brig, Gen. Samuel Garland. VMI. Summary: Samuel Garland, Jr. was born in Lynchburg, Virginia in 1830. He attended the Virginia Military Institute where he graduated third in his class before going on to law school at the University of Virginia. When Virginia seceded from the Union in the spring of 1861 Garland left his law practice to join the 11th Virginia Infantry as a Colonel. Garland earned a reputation for bravery in battle and was promoted to Brigadier General. During the Maryland Campaign Garland's brigade was tasked with defending Fox's Gap during the Battle of South Mountain. This battle was a turning point in the Maryland Campaign, which had previously been met with Confederate victory. However, unbeknownst to the Confederates, Lee's battle plans had been discovered by Union forces and when Lee divided his army between Harpers Ferry and South Mountain the Union advanced. At the South Mountain gaps the Union met with a relatively small Confederate force, amongst this force was Garland's brigade. During the fighting Garland was killed. In his official record of the battle D.H. Hill called Garland a "pure, gallant, and accomplished Christian soldier." Military: Samuel Garland, Jr., VMI Class of 1849, served as a Colonel in the 11th Virginia Infantry and led his regiment at 1st Manassas. 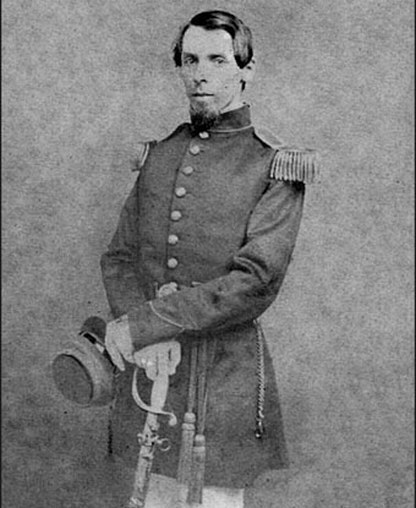 He was promoted to Brigadier General in May 1862 and commanded his brigade at Seven Pines, Gaines's Mill, and Malvern Hill. Garland was mortally wounded on Sept 14, 1862, at South Mountain and is buried at Lynchburg, Virginia. 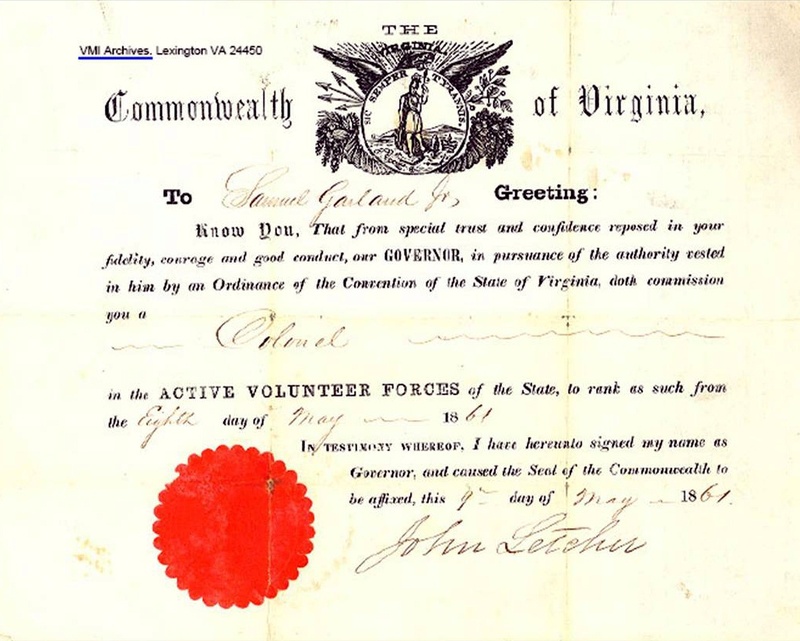 Garland's commission was dated May 8, 1861, and reflects that he was appointed a Colonel in the Virginia Volunteer Forces. The document was signed by Governor John Letcher and there is an endorsement on the back by Lewis B. Butler, Justice of the Peace for Prince William County, certifying that Garland took various prescribed oaths. This book describes the Stonewall Brigade in combat from first mustering to bitter end, when only 210 ragged and footsore soldiers remained of the 6,000 that served through the war. Absolutely a must read for the Civil War buff!